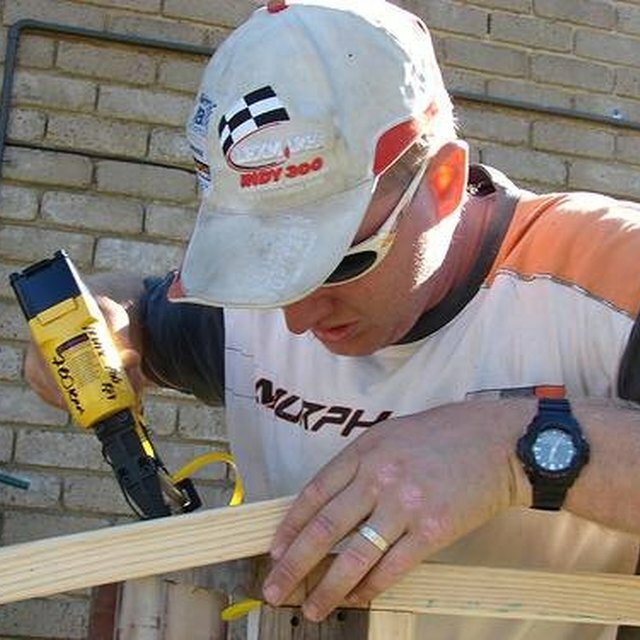 Nail guns are common on both construction sites and in the garages of everyday people who like to work on their homes. Nail guns can dramatically cut down the time it takes to complete a task, and they can make the entire job much easier. The nail gun was invented in the mid-1950s by a group of men who used their experience with machine guns during WWII to create a basis for the idea. The group created the first nail gun and traveled the country to find investors to back the idea. Nail guns typically use electromagnetism, compressed air or a flammable gas such as propane or butane to project a nail quickly into a surface. There are a variety of nails guns on the market today. Nail guns are largely defined by the type of material that you are working with. A roofing nail gun is used for roof work, whereas a concrete nail gun is used for situations in which you need to nail into concrete or another particularly hard surface. Nail guns use cartridges or clips of nails rather than individual nails. The clips allow you to load nails much faster and get your work done more efficiently. According to the US. Centers for Disease Control and Prevention, close to 37,000 people go to the emergency room each year with injuries from nail guns. Most of the injuries are to the feet and hands and are caused by the nail gun user not paying close enough attention to what he is doing. When using a nail gun, be aware of your surroundings and wear protective eye gear.